Starfish are saltwater animals known for their vibrant colors, vastly different appearances from each other by species and the ability to regenerate when they lose an arm. For years, marine aquarium enthusiasts have wanted to add them to their systems, but as starfish demand excellent water quality and a reef tank setting, most systems are unable to sustain them. Now, with reef tanks being commonplace, starfish have entered the market with great force. Acclimate your starfish by dimming the lights and floating the bag the starfish comes in from the aquarium store for several minutes to adjust the temperature of the water to the tank. Add about a quarter cup of tank water to bag every three minutes until you reach roughly 3 cups. Remove starfish from the bag using your freshly rinsed hand (without soap) or net. Place the starfish into the tank being sure not to introduce water from the bag. Wait a few minutes then return light to its normal strength. Observe the starfish making sure that no fish are attempting to chew on it. Do not attempt to feed your starfish, which will receive nutrients by sifting through the sand. The presence of established sand is a requirement in successfully keeping them. Vacuum only one half of the tank's sand when doing monthly maintenance. Vacuuming the entire tank will remove too many nutrients, and the starfish will die. Take water into a reputable aquarium store once monthly (most will do complete testing for free) to ensure it is within the range for starfish (the aquarium store will be able to tell you). Replace any live stock or rock you have lost with new live stock. Without them, there will not be enough nutrients in the sand to sustain the starfish's life. Monitor the activity of the fish in your aquarium. Fish such as triggers will eat starfish. 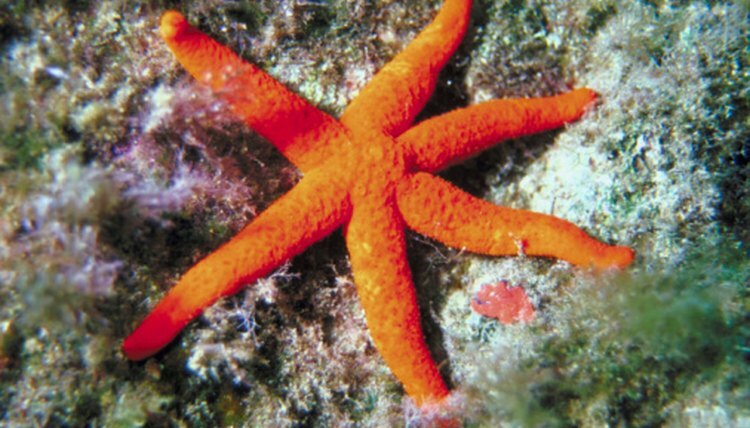 Starfish are susceptible to poor water quality. If you do not keep your water up to par, they will surely not survive. An excellent way to keep water pristine is to not overfeed your fish. Doing so will result in a toxic ammonia spike. Ask about your particular species of starfish; some are carnivorous and can be problematic. Your aquarium store can provide you with this information. Having conducted therapy for several years, Lawrence Gould decided to try his hand at writing in 2009. He has been published on Starpulse.com and various other websites and worked as a journalist at "TCpalm Newspaper" out of Vero Beach, Fla. Gould possesses a master's degree in psychology, a minor in English as well as extensive study in addiction. What Unique Trait Does a Starfish Have? Are Starfish Easy to Keep? Can You Put Fish in a Saltwater Pool?